This article considers the paradoxes of visualizing the networked image in the contexts of data mining and social media networks. Reference this essay: Goddard, Michael N. and Grace Kingston. “The Aesthetic Paradoxes of Visualizing the Networked Image.” In Leonardo Electronic Almanac 22, no. 1, edited by Lanfranco Aceti, Paul Thomas, and Edward Colless. Cambridge, MA: LEA / MIT Press, 2017. When imagining cloud data, it is easy to picture a large, sprawling mass of interlocking nodes, mutating and all sharing information simultaneously. With so many sources contributing to this abstract cloud at once, our picture of cloud data can seem ‘noisy,’ with each element making sense individually, yet quickly becoming unrecognizable en masse. Visualizing this cloud is paradoxical, in that the role of the cloud is one of personal hyper-visibility, revealing locations, preferences, and other markers of subjectivity, but through a process that remains opaque. How can these processes of cloud formation and deformation be rendered visible, and what kind of topography does this produce? Such questions require both practical and theoretical responses, hence the collaboration between aesthetic practice and theory that underpins this paper. Grace Kingston has mined shared data and responded aesthetically to such questions in her latest project and exhibition, Here You Are. The title of the project is a play on the traditional ‘you are here’ phrase seen on public maps, as the work plots the movement of peers as a group, rather than individuals. In this paper, she discusses her deployment of the mining, imaging, and social politics revolving around these data spaces, wherein privacy and anonymity are assumed, but poorly understood. Michael Goddard responds to Grace’s project as it reveals the invisible penumbras and noise underlying the contemporary networked production of subjectivity. Such data visualization aesthetics will be presented as the inverse of data mining for commercial and surveillance purposes because, rather than searching for particular subjective content to track and exploit, it reflexively reveals the very structures through which this circulation occurs. Grace Kingston (GK): Operating within the cloud has fundamentally revolutionized the way in which we interact and work with each other. Connecting our output and personal data with other individuals and communities has resulted in an intricate network with implications we are only beginning to understand. It is becoming clear, however, that our data has easily translated into both social and monetary capital through the process of data mining. Throughout this paper, we investigate the nature of data mining through artistic visual translation, and also consider the larger cultural and social consequences of the cloud. The mining of personal data became par for the course with online social interactions almost as soon as these interactions became a necessary element of our lives. The consequent visualization of social mining is most obviously seen in the targeted ads on Facebook. No sooner have you typed “comfortable underwear” into Google before you find ads from Bonds appearing next to your friends’ riveting food blog updates. While this comes across as creepy infringement at first, it quickly becomes the norm in our online excursions. I would argue that the speed of our acquiescence is largely due to the personal bond we feels with our personal computer. After all, more often than not, this machine has traveled with us throughout significant periods of personal change. Due to this companionship, our machines can become like close friends or, more accurately, the device through which we develop our preferred, constructed self. This trusting bond with our machines allows for our personal data to appear innocuous, regardless of the platform on which it appears. While we are aware of the methods by which this personal data has materialized, we are not so fully able to understand the implications of our data being “out there” in the general population. Michael Goddard (MG): This raises further questions about just where, in fact, our personal data is. While everything is now engineered to make us feel like the cloud is both everywhere and nowhere – a “non-place” or a literal utopia – it is common knowledge that, depending on the software involved, this data is in fact being accumulated in giant server farms in some obscure, offshore location. It is also quite likely to be making its way to wherever the US National Security Agency (NSA) and other surveillance organizations process their/our data. Therefore, the salient question becomes not what is the cloud, but rather where is the cloud? This implies a political geography of networks that are everywhere and nowhere—“rhizomatic,” decentered, many-to-many conduits for communication—but in reality, these networks pass through specific channels with significant bottlenecks in the United States, which enable the NSA to spy so easily on global communications. This also points to a world thoroughly mediated by the internet, in which entirely new relations between secrecy, privacy, intelligence, and public knowledge develop. So even if our data is indeed somewhere, ‘somewhere’ is not revealed to us. Moreover, our data is a technical black box; even if we could locate it, it would be impossible for us to read, even if it is simultaneously being decrypted by automated processes that detect whether there is a hidden menace lurking somewhere below the pop videos, drunken nights out, and cute cats. Rather than an ontology of the cloud, these circumstances demand a political geography, something Benjamin Bratton has been attempting with his concept of “the stack.” Inspired by the design of computer architectures themselves, Bratton extrapolates this to a planetary level, insisting that we are coming to live within a mega-computational architecture of which the cloud will be but one component: “The Stack, in short, is...rendered now as vertically thickened political geography. In my analysis, there are six layers to this Stack: Earth, Cloud, City, Address, Interface, and User.”  All of these terms have common-sense meanings, yet when probed further, they reveal mutations and ambiguities: the earth no longer exists as it was imagined in classical ecology, but is rather an environment that has been profoundly transformed by humans and technology and that is arguably passing from an Anthropocene to a post-Anthropocene world; ‘users’ are agents that can by no means be assumed to be exclusively human, and so on. Where the cloud is concerned, Bratton sees it as potentially constituting a new kind of State – or a future of the State – that is no longer tied to a specific territory, but that impinges on existing territorial States: as can be seen in the conflict between Google and China, for example. On a more intimate level, we are increasingly becoming dual beings with two habitations: one in a conventional organic body, delimited in time and space, a ‘here and now’; and the other taking the form of a data cloud distributed across multiple networks and housed in who-knows-what and who-knows-where, in server farms and databanks. Perhaps this constitutes even a third layer of existence. Alongside our actual, bodily consciousness there is also the hyper-visible identity we are constructing for ourselves across multiple networks and that other agents can read, while an even further invisible self is constructed from our data footprint. This data footprint encompasses those autonomic processes we are only dimly or not at all aware of, such as the trace left when we are tracked by a surveillance camera without our knowledge, or the trail left by internet and mobile searches, geo-tagging, and so on. But we can be sure that this invisible self is being seen somewhere, even if only by nonhuman agents, and coming to the attention of those we continue to naively think of as “secret agents”—or intelligence analysts—when certain flags are raised. Finally, there is perhaps a fourth self, no longer individuated at all, wherein our captured data is merged with the sea of ‘big data’ as one piece in a collection of phenomena or so-called social trends. Within these trends, our individuality and subjectivity is barely relevant, as this sea of data is re-singularized for advertising purposes to arrive on our Facebook walls or email accounts as “personalized” spam. In such a complex and opaque—even cloudy—world, visualizing one’s place within these different data clouds becomes a pressing and vital concern. GK: It is for this reason that, for the last four years, my studio-based research has focused on transposing our online lives and personas back into the offline world. In my most recent exhibition, Here You Are, at Archive Space in Sydney, I created a project based on data collected from Facebook check-ins. I monitored my friends’ check-ins to glean the places people would go in order to be hyper-visible. Facebook check-ins are a feature introduced in 2010 that allow users to share their locations via Google Maps on their timelines. This feature allows users to include a status update and a photograph. All three of these elements were explored in the exhibition. The check-in feature was of particular interest to me in relation to the cloud because, as most people know, any update we make on Facebook is automatically geotagged with our current location. I wanted to discover the places in my community that people wanted to be “seen.” As well as a visual communication tool, check-ins are often used as means to boast about the activity the user is undertaking. Figure 1. 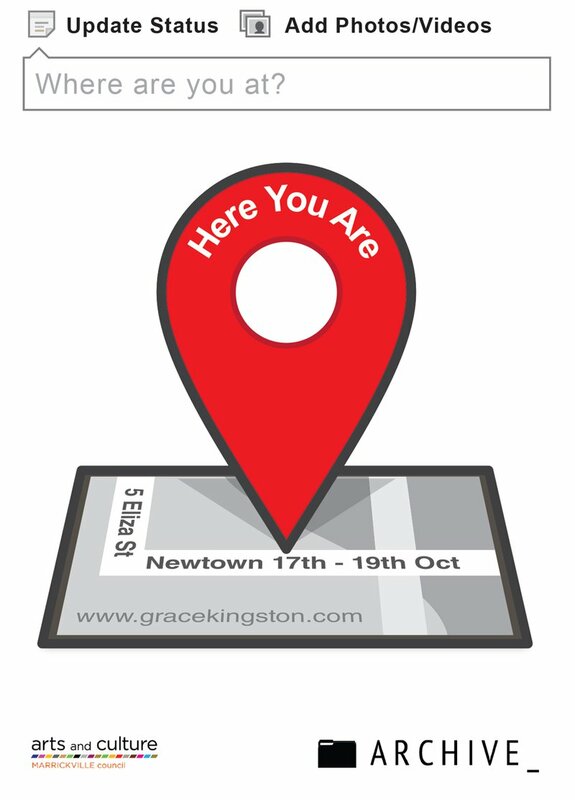 Grace Kingston, Here You Are Invitation, 2013. Image by Grace Kingston. © Grace Kingston, 2013. Used with permission. I created a sculptural installation to represent the data collected. To do this, I created small sculptural replicas of the “drop-pin” used to point out a location on Google Maps. The installation was geographically aligned with the area and based on a scaled map covering a one-kilometer radius from the gallery, in which one millimeter was equivalent to one meter. The number of drop-pins corresponded to the number of check-ins at each location, where one centimeter was equivalent one check-in; for example, Thai Riffic received seven check-ins, so it was positioned seven centimeters from the floor. The data was counted by hand in order to prevent duplication, and we distinguished any doubled-up venue locations; for example, there were separate entries for ZanziBar and their event, ‘Birdcage.’ I wanted to create a new topographical map to investigate the landscape of ‘cool’ within the area, as no one was checking in at more ordinary locations. Figure 2. Grace Kingston, Drop pin installation #1, 2013. Image by Grace Kingston. © Grace Kingston, 2013. Used with permission. Figure 3. 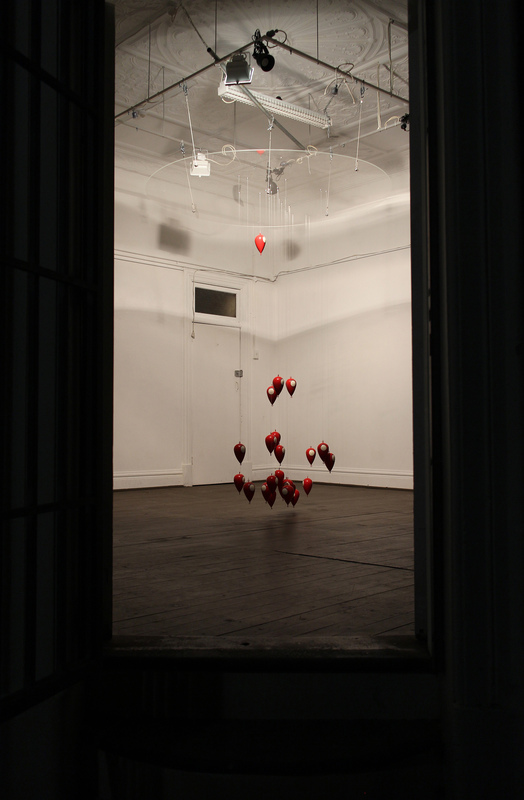 Grace Kingston, Drop pin installation #2, 2013. Image by Grace Kingston. © Grace Kingston, 2013. Used with permission. 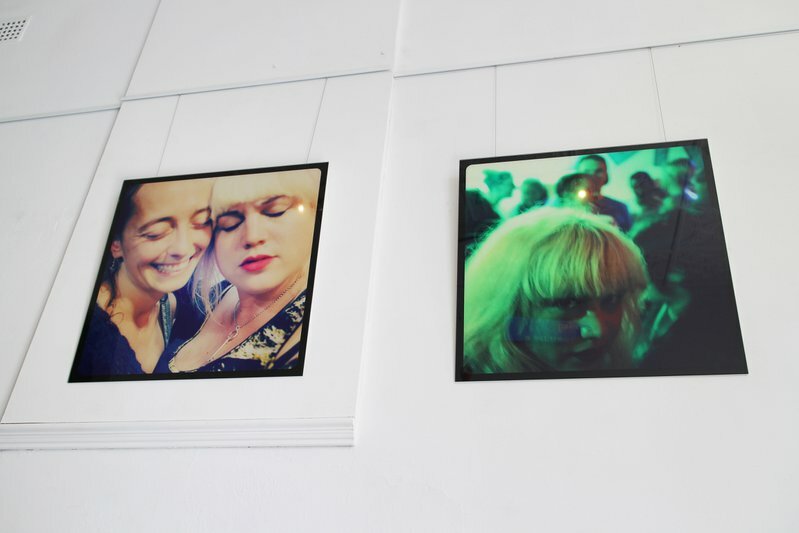 I took a picture of myself at the most popular locations in the study, ending up with three large-format ‘selfie’ photographs (90 x 90 cm) in the styles of Instagram, Hipstergram, and other photo-sharing online communities. The photos were taken at times when these sites were at their most popular. Unsurprisingly, all of these locations were bars, the most popular being the Courthouse between 10 and 11 PM, the Town Hall Hotel from 11 to 12 AM, and ZanziBar’s ‘Birdcage’ night between 12 and 1 AM. I magnified the scale of the images in the hopes of gleaning exactly what makes these places so important, and to playfully poke fun at the divide between high art and everyday life. I printed these images on glass in reference to the mobile, tablet, and computer screens on which these images are usually viewed. Figure 4. Grace Kingston, Selfie - Town Hall, Selfie - Birdcage, 2013. Image by Grace Kingston. © Grace Kingston, 2013. Used with permission. Figure 5. 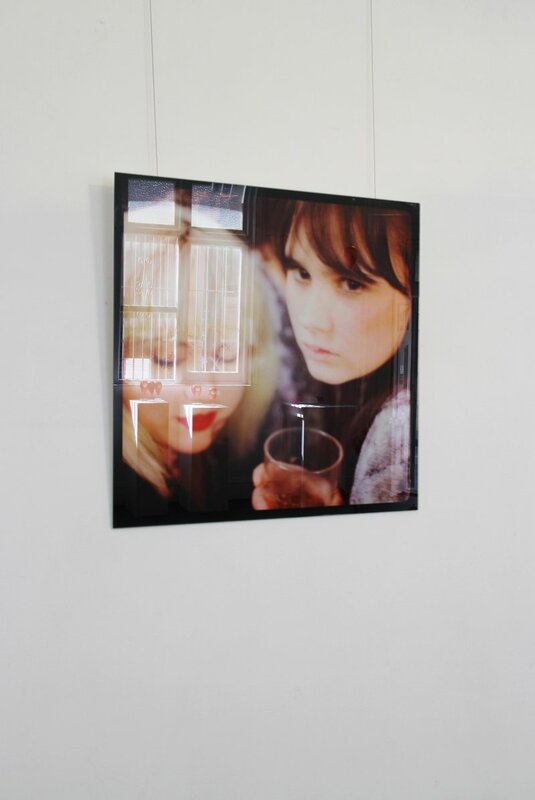 Grace Kingston, Selfie - The Court House Hotel, 2013. Image by Grace Kingston. © Grace Kingston, 2013. Used with permission. A series of example statuses that accompanied the ‘check-ins’ was collected and anonymously cycled through an LED sign. Touching on the theme of self-promotion mentioned earlier, the sign was displayed near the gallery’s window, as though it were advertising a special in a regular shop. Comparing these ‘embodied’ comments in the physical space that they were made, rather than the website they were posted to, absurdly translated these experiences back into the literal present. Figure 6. 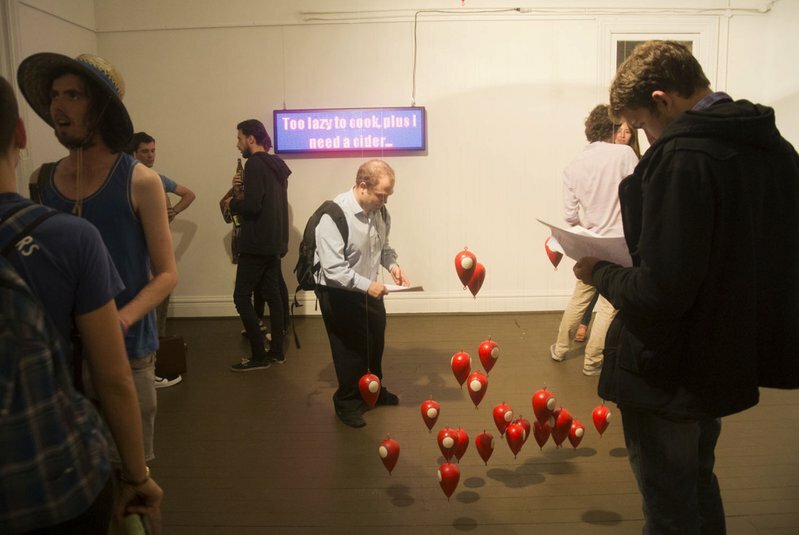 Grace Kingston, Installation with LED sign #1, 2013. Image by Grace Kingston. © Grace Kingston, 2013. Used with permission. Figure 7. Grace Kingston, Installation with LED sign #2, 2013. Image by Grace Kingston. © Grace Kingston, 2013. Used with permission. MG: Responding to this project in terms of the themes of the cloud, I see it as a kind of cloud ethnography distinct from digital ethnography, in that despite appearances, it requires a decentering, objective perspective, rather than the human-centric focus of most digital ethnographies. This is made clear by the title, “Here You Are”; this is not the “here I am” that the check-in is meant to indicate, but the “here you are” of being located and split between the user’s physical location and their position within the cloud. As such, it extends the effects of the cloud on the user, effects that detract from the user’s subjectivity and their desire to connect with others, display their hipness, or advertise their social life. Of course, this metadata is useful for processes that remain obscure, but that will ultimately reencounter the user in the forms of targeted advertising, spam, or—at the extreme—unwanted attention from the State or other security services. Whatever their ultimate uses and market values, these acts of self-location subject users to an intimate outside, through which self-promotion and self-representation transform into available and malleable data, which is another aspect of the installation. This intrusiveness was deliberately highlighted by the use of the LED sign, displaying these locational texts in kitsch fonts, thereby generating media-archaeological resonances with earlier technologies. Similarly, the transformation of the ephemeral selfie, taken at the most popular locations, into high quality works of fine art points to the fact that these acts of self-representation are in fact anything but ephemeral. Instead, they are stored, archived, and exchangeable on a range of markets, and may or may not return to the original user in an altered form. In short, these “self(ie)-representative acts” are acts of willing submission to the invisible hands of the cloud. They exist as sets of relations of data exchange and commodification that are by their very nature opaque and cloudy, but that nevertheless have a definable geography, as exemplified by their translation or tracing into the offline space of the check-in balloons in the installation. Visualizing all of this works against this cloud-logic not by rejecting abstraction as data, but by abstracting in a different direction. This abstraction entails a making visible—rather than invisible—a demonstration of how the small pleasures of social media are feeding all kinds of invisible processes. The act of making the invisible visible is not a form of resistance against this cloud condition from some impossible, “pure” outside perspective, but rather is an act of immanent complicity that nevertheless works against the cloud logic described above. This generates a sense that “another cloud is possible,” a condition of possibility that perceives the cloud in which we are currently caught. GK: Cloud computing offers a variety of useful and revolutionary opportunities, as the “noise” generated from the sheer volume of information has, in a way, become a new obstacle course that we are in the process of navigating. The internet age, and social media specifically, has been heralded as the great equalizer; everyone now has the opportunity to tell their story and have their narratives preserved. While “check-ins” are only one small facet of this documentation, the themes explored in the artwork can be applied to a variety of cloud-based discussions. The vast archival potential of the cloud is a central element of excited discussion amongst “cloud-heads,” yet with so much information, one wonders how much of it will ever see the light of day. With so much talking, who is actually listening? And if no one is listening, what is the point? In this scenario, a film like Inception takes on a documentary quality through its treatment of our subjective desires as the fuel for a mega-archival machinery. We are witnessing the transformation of capitalist realism into science fiction realism precisely at those places where we are playing out our most singular desires and enacting our most intimate social relations; we can check in and out anytime we like, but the reality is that the cloud we are checked into is rapidly becoming a space and a temporality that we can never leave. The graphical artwork Here You Are makes these processes of social media visible to the public. It, along with other artworks, can raise awareness for the need to develop more transparent practices and strategies for revealing the opaque networks concealed within the cloud. Glenn Greenwald, No Place to Hide: Edward Snowden, the NSA and the Surveillance State(London: Hamish Hamilton, 2014), 2. Benjamin Bratton, “The Black Stack,” E-Flux 53 (2014): n.p. Maura Reilly and Linda Nochlin, “Global Feminisms” [Catalogue essay] (New York: Brooklyn Museum of Art – Merrell Publishers Ltd: 2007), 231. David Greenhalgh, “Here You Are,” [Catalogue essay], (Sydney: Archive Space, 2013), n.p. Richard Grusin, Premeditation: Affect and Mediality after 9/11 (London: Palgrave, 2010). Alexander Galloway, Protocol: How Control Exists after Decentralization (Cambridge, MA: MIT Press, 2006). Rob Coley and Dear Lockwood, Cloud Time: The Inception of the Future (London: Zero Books, 2012), 57. Grace Kingston is a multidisciplinary artist whose work is primarily concerned with technology and its intervention on our bodies, identity and everyday life. She conducts research in the fields of social media, digital culture, bodymod, networks, environments and spatial-contextual awareness. Kingston has exhibited widely, both locally and abroad, including New York, Finland and Germany. 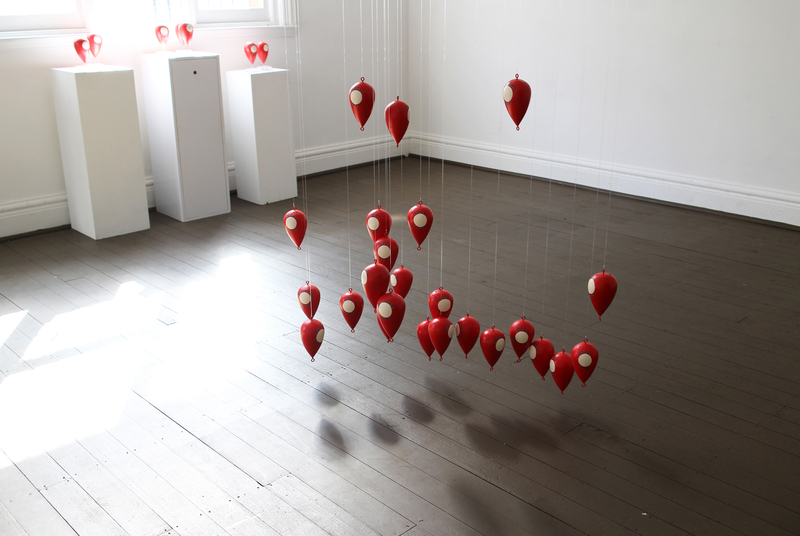 She was the recipient of the COFA traveling scholarship in 2011, the Marrickville council public artwork award (2012) and the Marrickville Independent Artist Award (2013). Her work has also been selected for the 61st Blake Prize (2012), the National Institute of Experimental Artists Rocks-pop up studio (2012) as well as various Art Month Sydney events in 2010, 2012, and 2013.